Our Conversion Driven PPC Services Will Bring New Leads For Your Business Guaranteed! If you are looking to generate real revenue from your website, you’ve come to the right place! Search Berg specializes in Paid Search marketing with a particular focus on Conversion Optimization, Lead Generation and Landing Page Analysis. Whether you run a small café or a large e-commerce store, our Paid Search Marketing can bring you new clients because our PPC works! Daily bid optimization to ensure max ROI for your campaign. Prompt identification and removal of harmful keywords. Identifying new keywords, new opportunities to generate leads. Calculating the best times to run campaigns for maximum exposure. Determining trends to run/pause campaigns to best serve clients. Landing Pages Optimization to Increase Conversion Rates And Advertising ROI. Keeping An Eye On Your Google Ads Competitors To Stay One Step Ahead. Determining whether clicks are legit or intentional and negative. Detecting multiple clicks based on time intervals and taking action. This feature kicks in as soon as a campaign goes live. Best utilization of a campaign budget daily, weekly and monthly. Speaking with Google on your behalf if a campaign is stuck. Get a Detailed Report of your Account or Campaigns' Flaws & Opportunities. Conversion Tracking To Help You Make More Profitable Advertising Decisions. What better way to gauge the efficiency of a PPC Agency? Imagine ranking above the #1 result on Google for your target keywords! Ads in Search campaigns appear above and below the Organic search result listings whenever a particular search term relevant to your target ad keywords is entered in Google. These campaigns show ads to people who are actively searching for products/services and have a genuine intention to make a transaction or purchase. Call-only ads, as the name suggests, focus on revenue generation through calls only. These ads appear on mobile phones and mobile tablets. They are designed to encourage people to call your business. When a potential customer clicks your ad, the ad initiates a call to your business from potential customers’ mobile device. Remarketing is a way to connect with people who previously interacted with your website or mobile app. It allows you to strategically position your ads in front of these audiences as they browse Google and its partner websites, thus helping you increase your brand awareness or remind those audiences to make a purchase. Type in any clothing item like men’s tank tops in Google and click “Search”. You will see what Google Shopping is all about. A collection of different websites selling Nike shoes will be displayed to your right. With Shop campaign, you can target potential buyers looking for products and in some cases services that you are selling. Shopping campaigns are designed to promote your online/ecommerce store. Local Services ads help you to advertise your business on Google and receive leads directly from potential customers. You can connect with people who search on Google for the services you offer. Your ads will show up for customers in your area, they will contact you via phone calls and messages. You can reply to messages, track bookings, and manage all your leads anytime online and through the app (Android, iOS). Our PPC Services Make Cent$! 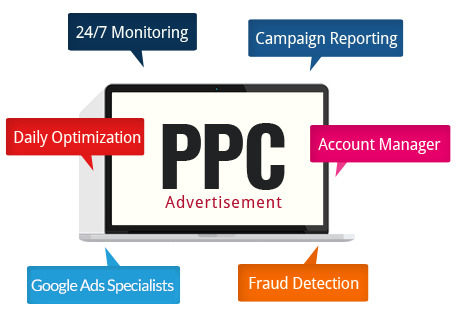 At Search Berg, we really believe we have the complete PPC package. We are in the business of generating leads for our clients by creating catchy, appealing ads. Add 24/7 Monitoring, Daily Optimization and state of the art Click Fraud Detection and Prevention to the mix and you have a fail-safe approach to generating more phone calls and more leads for your business. Businesses who are serious about generating leads from their website, should definitely take up PPC. Our Pay Per Click Advertising services are affordable and require no contractual obligations from the client. This is done specifically so clients can feel comfortable about their PPC project and gauge us on the results we deliver. Our PPC packages are fully customized for each website to get more ad impressions, CTRs and conversions. See how our PPC works. Utilize PPC to its full potential! Generate revenue from your website for your business. Our team of Adwords Certified individuals will set up your campaign from scratch for enhanced revenue and lead generation. Start making money today! Contact Search Berg today by phone or chat or complete the form above and receive a free PPC audit report.